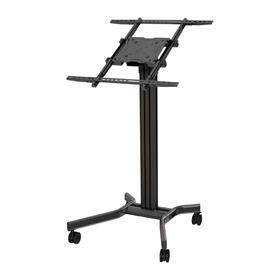 Display This Way - Buy Flat Screen Mounts, Monitor Stands & TV Floor Stands made by Premier Mounts. More information on the Crimson MK65 Mobile Kiosk Floor Cart for Large Screens made by Crimson AV is below. More information on the TL84-MS2 84 inch Chrome Lightweight Floor Stand with Tilt Mount for Large Screens made by Premier Mounts is below. Display This Way offers high quality audio video mounting products made by Premier Mounts, Chief, Peerless AV, Crimson AV, Omnimount, Ergotron and other manufacturers of professional mounting solutions products. We are certified mounting experts of their products. If you have an audio or video display project, you've considered using any of the products at DisplayThisWay.com, and you'd like help with configuration, we can and want to help you! Our goal is to help you find the exact mount or stand that will fill your needs, and then to get those products to you quickly so you that you can complete your project with the best, highest quality stands and mounts around. All of the mounting products at Display This Way ship fast and free. Our store is staffed with certified audio video mounting experts. At our online store you'll find stands and mounts for TVs, monitors, projectors, video components, digital signage and home theater displays. Our store also offers mounts, stands, carts, adapters, and other mounting hardware. We offer mounting solutions for the DIY home installer as well as those to be used in commercial settings, business environments, educational, institutional or medical settings. From mounts for flat-panel displays to projector mounts and monitor stands, we have what you need to put that monitor, TV, projector or digital sign wherever you want to place it. Let us help you configure the perfect set up for your specific application. Call our experts today at 1-800-807-1477. Our sales team members are certified mounting experts ready to help.